And one more Tetris clone, one! 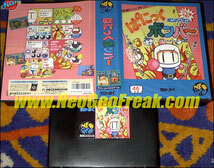 Most Neo Geo players might know - but few possess - the excellent Neo Bomberman, released in 1997 for the MVS system. 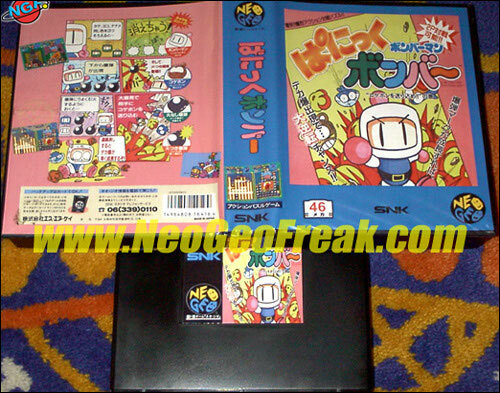 This game takes back the gameplay of the different episodes of the Bomberman series, created by Hudson Soft in 1983. 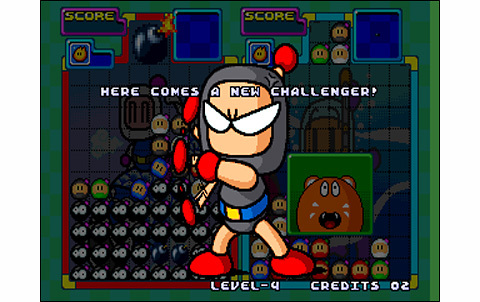 Panic Bomber, him, went pretty unnoticed: this one's a puzzle game mixing Tetris and Puzzle Bobble mechanisms, mixing these in the world of small helmeted men! 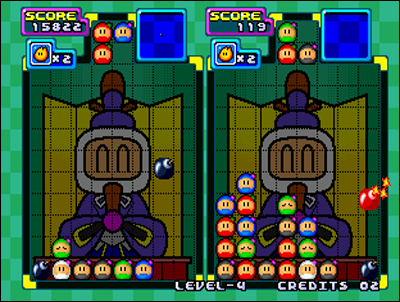 SNK system has a dozen of these puzzle games, among which a few are remarkable: there is of course the Puzzle Bobble games, their clones Puzzle de Pon made by Visco, Magical Drop II and III by Data East, Money Puzzle Exchanger, Puzzled, Ghostlop, Pochi & Nyaa, Pop'n'Bounce, and Zintrick, only released on Neo Geo CD. A small but relatively good catalog, with some interesting and innovative titles. Do the same goes for our Panic Bomber? 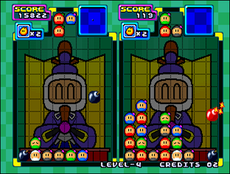 The one-player game consists in facing nine opponents as cute and insignificant each other, through duels with individual screens. 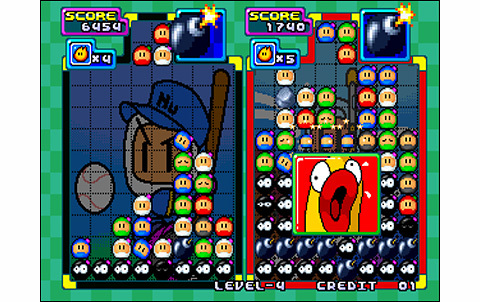 Each one in his playground have to stack blocks composed of three different colored helmets. Like Tetris, it is possible to rotate, move left or right or accelerate the fall of these blocks. 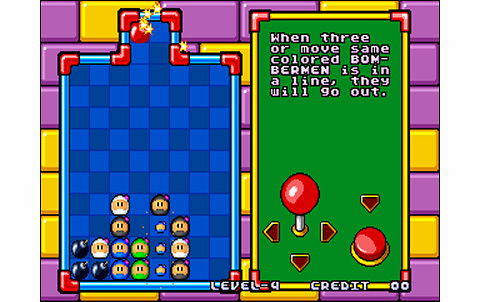 Starting from three identical helmets lined up horizontally, vertically or diagonally, they explode and generate a bomb in the playground. 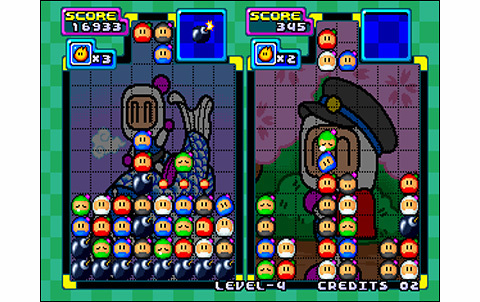 When they disappear, they can initiate chain reactions, for example with the blocks lying above falling. 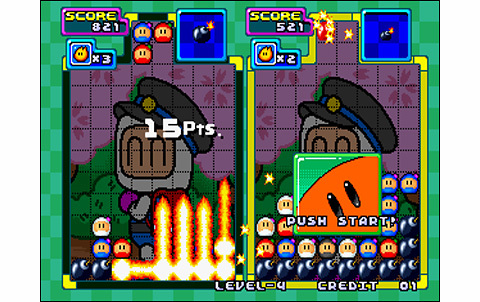 After a certain number of removed blocks, comes an activated bomb: player have to place it in order to make the most of these bombs explode on his table. So our play area is cleaned and penalty hotheads are sent to the opponent. Once the playground of a player becomes saturated, this one loses. These principles are kept for the two-player games, without additional rule, except that you need two successul rounds to win the matches. 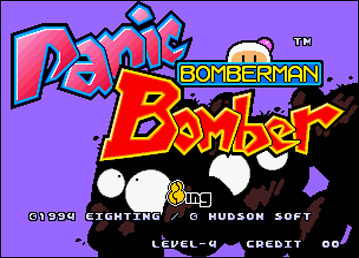 With these observations, it seems that taking pleasure playing Panic Bomber, requires a certain taste for masochism. Not only the gameplay is extremely bland, but the realization of the game is damn poor. Oh sure, the game doesn't sink as deep as Legend of Success Joe or Fight Fever, for sure! But still, the graphics are damn ordinary, the animation makes the bare minimum... and there's only the music that compensates a little, appropriately accompanying the action while being varied. 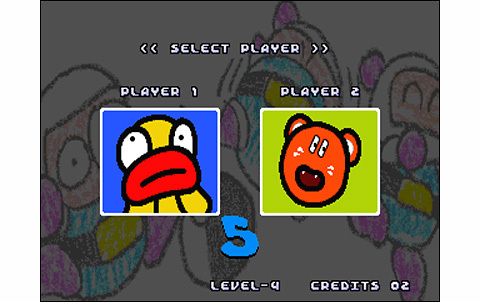 The creators of PB had to spend less than five minutes on a table corner to develop the game mechanics, as programmers they surely did not allowed much more time to give birth to this hymn to emptiness. 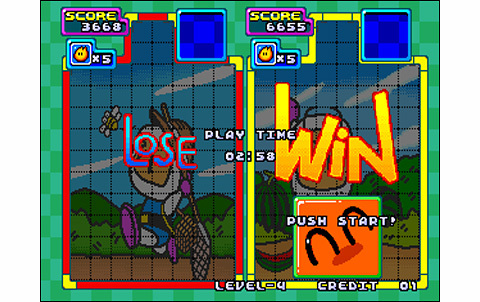 When you know that on this very same system and for an equal price, you can enjoy great titles such as Puzzle Bobble or Ghostlop, you'd have to be crazy to waste time with a game hardly worthy of an Android app! 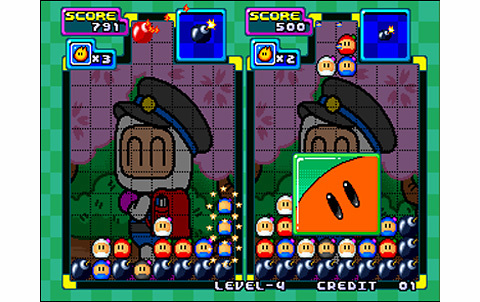 The graphics are simplistic and look like they've been drawn by a ten years-old child, but they're faithful to the Bomberman style! 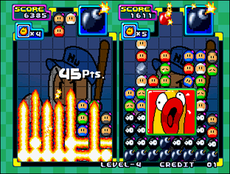 The game is decently animated, with a few well-made explosions and ordinary effects. 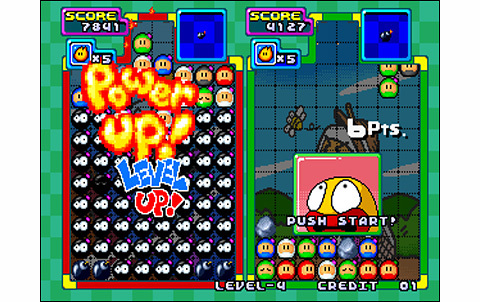 The musics are more varied than Puzzle Bobble's ones, and the FX are doing Par. 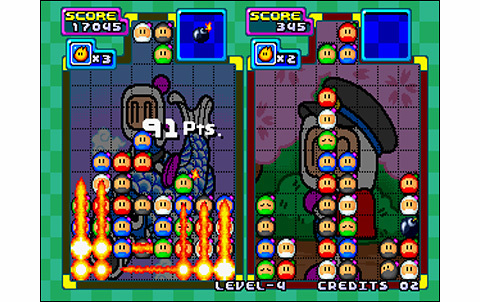 There's nince tough opponents to beat in single-player mode, and a pretty lame VS mode... You might quickly want to get into something else! 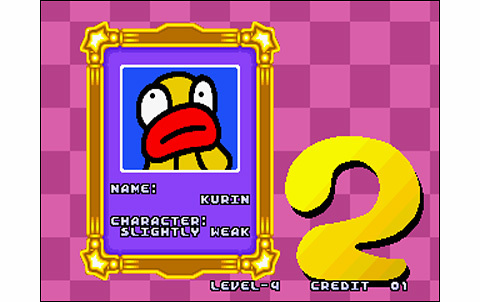 The game mechanics are not very complex nor interesting, while the room for improvement is almost non-existent. Can't be a Tetris who wants! Here's a pretty dispensable puzzle-game, with a realization and gameplay almost uninteresting! 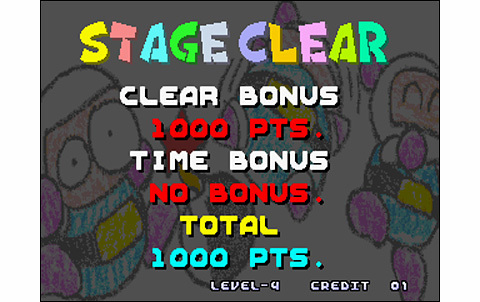 Panic Bomber clearly can't face Puzzle Bobble, nor any second-choise puzzle game on the system: with a price around 150 euros, even the average Puzzled offers a better price/pleasure rate!